Skyler Tanner explains what happens to the cardiovascular system during high intensity training (resistance training) and cardio (aerobic exercise), as well as things like Vo2Max, endocannabinoids and sprint interval training. Skyler Tanner is an exercise physiologist based in Austin, Texas where he operates Smart Strength, a HIT-focused, evidence-based, strength training studio. Skyler also regularly brings a fascinating perspective to all things exercise, through insights on his blog, skylertanner.com. 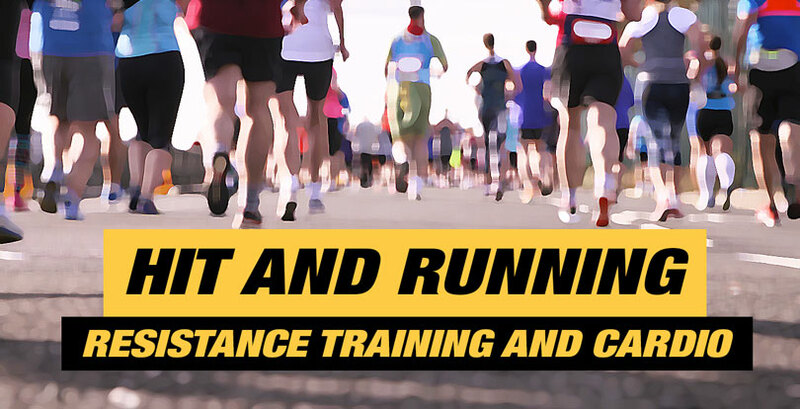 I have been intrigued by his recent writing on combining resistance training or HIT with running, an interest that he has developed over the last 5 years. Before any die-hard HITers choke on their coffee at the mere mention of running, Skyler still communicates that by far the most important thing that you can do for your physiology exercise-wise, is to apply HIT. Some may feel they have little interest in running, so why care to read about this topic on a HIT-focused blog? This is an opportunity to review some of the ways the cardiovascular system responds to exercise; HIT and aerobic, are there any valuable differences? Recently discovered benefits? As a trainer you will likely have clients who are runners, cyclists etc. A couple of weeks ago I connected with Skyler over Skype to discuss how he got interested in running. We talked about the impact that resistance training or HIT has on the heart and cardiovascular system, and if there are any unique benefits that running/aerobic exercise stimulates. We discussed in some detail the aerobic protocol that is most akin to HIT: sprint intervals. I also asked Skyler whether he actively encourages his clients to add some form of aerobic exercise between their HIT workouts. 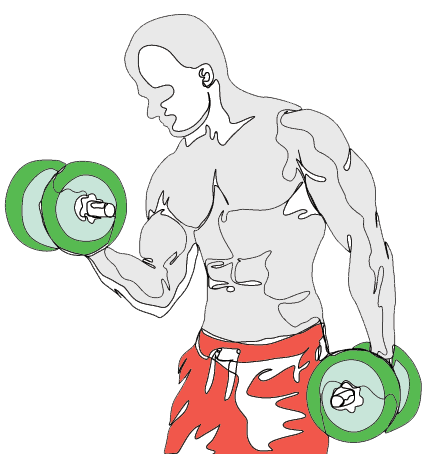 What happens to the heart and cardiovascular system during resistance training? We began our conversation by discussing the cardiovascular system’s response to HIT. Skyler explained that one of the most notable responses is an increase in stroke volume in the heart. This means a greater amount of blood is pumped out of the left ventricle with every cardiac beat, concurrently there is also an increase in heart rate or the number of times the heart beats per minute. An individual may start out their workout with a heart rate of 80 beats per minute (bpm) and by the end of the first exercise, let’s say a pulldown, this may have elevated to 120 bpm. The combination of an increased stroke volume and greater bpm produces an increased cardiac output: more blood (measured in liters per minute) is pushed out of the heart. Skyler went on to mention that at the same time as this increase in cardiac output, there is a decrease in systemic vascular resistance– the blood vessels dilate to allow for the increase in blood flow. All of which means that more oxygenated blood can reach the working musculature during your pulldown. Although heart rate increases during sets taken to momentary muscular failure (MMF), it does not reach very high levels under normal resistance training workout conditions (no rush-factor and the use of proper breathing). Skyler suggests that heart rate typically settles at about 60% of an individual’s heart rate maximum (HRM) during this type of workout. As I happen to have my heart rate readings from recent workouts to hand, let’s do the math. Keep in mind that my maximum heart rate, achieved during a field test, is 204 beats per minute. It turns out that my average heart rate over the course of a 20-minute HIT workout (8-9 exercises, full body) is 114 bpm or 56% of my maximum. My peak heart rate reached momentarily during a recent HIT workout is 136bpm or 67% of maximum. Those figures tally well with Skyler’s reference to 60%, he explained that this coincides with the levelling off, of stroke volume. Of course, if you do use the rush-factor (no rest between sets/exercises), then heart rate can increase significantly above this level. Our discussion then shifted to VO2 max, a measurement of the maximal amount of oxygen a person can use during intense exercise. It is widely considered a marker of cardiovascular fitness and aerobic endurance and is measured in milliliters of oxygen used in a minute, per kilogram of body weight (or the ever so slightly less of a mouthful: ml/kg/min). The higher the individual’s VO2 max, the fitter they are considered. VO2 Max is widely considered a marker of cardiovascular fitness and aerobic endurance. The higher the individual’s VO2 max, the fitter they are considered. In the general population, a VO2 max of 45 ml/kg/min in a 35-year-old man, would be considered good (VO2 max typically declines with age). This reading in the athletic population would also be normal for a Powerlifter or a shot-putter. Elite cyclists, distance runners and Nordic skiers however, can double that VO2 max with readings ranging from the low 80’s through to the high 90’s. The highest ever recording of 97.5 was measured in 18-year-old cyclist, Oskar Svendsen in 2012. What does working at VO2 max effort feel like? For a runner it is the fastest possible pace sustainable for about 8 continuous minutes… or damn unpleasant. We have seen above that it is possible for a professional athlete to have a reading of anywhere from the 40’s to the 90’s depending on the sport. Does that mean that the sport you engage in dictates your VO2 max reading? Perhaps a little, but that is certainly far less of a factor than genetics. Exercise can have a positive impact on a person’s VO2 max, Skyler mentions that this is often in the region of a 10-15% improvement, but of course ultimately potential is dictated by genetics. This is as true amongst athletes as it is in the general population. Just as switching an elite marathon runner to a bodybuilding-only routine is not going to produce a Mr. Olympia, getting a shot-putter to exclusively train as a middle-distance runner is not going to produce a VO2 max of 90+. The sport selects out the best suited physiology, anything after that (exercise, nutrition etc.) is refinement. Source: Kenney WL, Wilmore JH, Costill DL. Physiology of Sport and Exercise. Champaign: Human Kinetics; 2012. What effect does HIT with sets taken to MMF have on VO2 max? This means that you can probably max out your VO2 max with HIT alone, like Skyler did. The reason for this is that HIT stimulates enhancements in the ability to extract oxygen from the blood at the tissue level, in the working muscle. In effect it doesn’t matter if you are sprinting or performing a leg press to MMF, your body needs to get as good as it can at getting the oxygen it needs. What happens to the heart and cardiovascular system during aerobic exercise? Next, I wanted Skyler’s view on the impact of traditional aerobic exercise on the cardiovascular system, both acutely and chronically. Skyler explained that just like with HIT, when an individual begins an aerobic activity such as a run, heart rate increases, as does stroke volume and overall cardiac output. However, whereas heart rate during HIT tends to plateau at around 60% of maximum, the heart responds to sustained aerobic activity by increasing heart rate beyond this level when needed to match intensity. For example, during a field-test to find my own heart rate maximum, I ran for 2×3 minutes flat out with a 2-minute rest between the intervals. I reached a maximum heart rate of around 200 bpm during the second interval, having moved through the entire range of heart rate response. 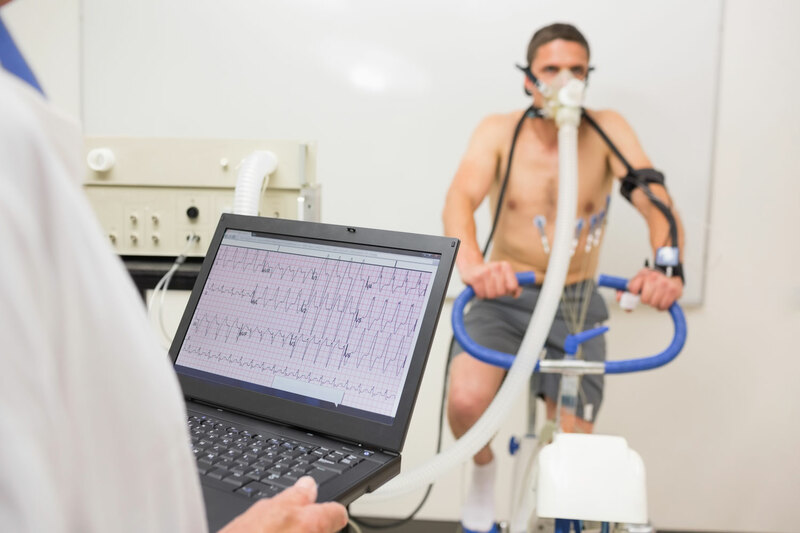 When it comes to the chronic effect of regularly running at a moderate aerobic pace, Skyler mentioned the plasticity or trainability of heart rate response to the demands of aerobic exercise. The more you practice moving at a pace, the more efficient the heart gets at providing oxygenated blood for that level of effort. Over time the heart can support the sustaining of a certain pace with a lower heart rate (within limits), and heart rate at rest can decrease too. This is certainly beneficial for the running enthusiast, but does this adaptation provide any physiological benefit to someone who doesn’t care about running? According to Skyler, the best evidence of any wider benefit of this is research connecting lower resting heart rate with long-term cardiac health and a reduction in all-cause mortality (2,3,4,5). It is worth mentioning that this adaptation can likely be attained through rush-factor HIT performed in a circuit manner too. That said, unless you want to be a runner/cyclist or other endurance athlete then there isn’t really any hugely compelling evidence to suggest that you need to do a specific aerobic activity beyond HIT for your physiological wellbeing. Why would you if there is no additional benefit? And how is it that more people regularly engage in running than resistance training, despite the fact the physiological benefits of HIT are greater? There are myriad reasons why this may be the case; running is instinctive, as Skyler mentions, kids do it all the time without thought, and for adults there are almost zero barriers to entry. Resistance training on the other hand, is more complex to understand, to get right and to program effectively: to the beginner it can be comparatively confusing and intimidating. There is another reason people engage in aerobic exercise. During our preamble to the Skype interview, Skyler and I were exchanging anecdotes about the feel-good factor we both get from running, Skyler described this as the gift of flight, which reminded me of Richard Bach’s book, Jonathan Livingston Seagull. There is a certain something about flying across terrain at a swift pace, entering a flow state, and enjoying the moving meditation offered by running. Skyler explained that in running animals (think mouse, dog, horse and human) there can be a bliss-like state experienced after about 20 minutes of continuous moderate intensity activity that just isn’t produced during resistance training. In the past, this so-called runner’s high was ascribed to the release of endorphins (peptides which activate the body’s opiate receptors). In the last five years or so, research has shown that this effect is likely at least as much due to the release of endocannabinoids as endorphins, if not more so. Endocannabinoids are exactly what they sound like, cannabinoids that are biosynthesized in the body. You literally can get high on your own supply… if you are prepared to go for a 20-minute jog. Endocannabinoids have the potential to reduce anxiety and sensations of pain and are crucial for the “main aspects of a runner’s high”(6). 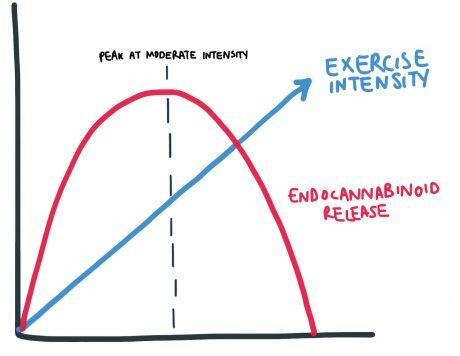 Although circulating endocannabinoid levels are increased during all intensities of exercise from very low to very high (which would include HIT), the “bliss amide” anandamide (a type of endocannabinoid) is released to a far more significant degree at moderate exercise intensities(7). The sweet spot of endocannabinoid release is moderate exercise. The extent to which the individual experiences this side effect of endurance exercise, is likely somewhat genetically moderated, your mileage may vary (just make sure you do inhale… and exhale). For those who experience a significant runner’s high that may be reason enough to add the odd 20-minute jog to your week. So far, significant endocannabinoid synthesis has been the first definitive additional benefit of adding any type of aerobic exercise to a solid foundation of HIT that Skyler and I discussed. What about sprint intervals though? It seems that today as many, or more people are likely to perform sprint intervals as those who go out for a measured jog. Skyler’s perspective is that sprint intervals do not add anything that resistance training or HIT doesn’t provide, from a general fitness perspective. See also our commentary on research by Steele et al. comparing sprint intervals with resistance training to MMF. However, Skyler elaborates that sprints are very useful, essential for someone who intends to run races to the best of their potential. He performs sprint intervals specifically to help improve his 1 mile, 5k and 10k times. To run fast, Skyler explains, you need to practice the skill of running fast, you need to develop your running economy and aerobic performance. You also need to improve your ability to tolerate the sensations of suffering that are experienced both during maximal sprints and during best-pace races. Sprint intervals are a very efficient way to stimulate these adaptations and improvements(8). Marrying the ability to move at a faster pace to the demands of a particular (race) distance. Sprint intervals are important if you need to move fast (on your feet, on a bike, on a boat, on skis etc). However, if you already do HIT and have no interest in developing your ability to run fast, or to move fast in any aerobic activity then you don’t really need to sprint. Does Skyler encourage his clients to do any aerobic activity? It is only in the past few years that Skyler has developed a personal interest in running, initially as an opportunity to spend a little more quality time with his wife (a cross-country runner) one morning each weekend. He maintains that once a week running frequency to this day, in tandem with his once a week HIT workout and most importantly he enjoys it. As our conversation was drawing to its close, I wanted to find out if Skyler actively encourages his clients to do some form of aerobic activity, or even specifically to run like he does himself. 1. Resistance training to momentary muscular failure improves cardiovascular fitness in humans: A review of acute physiological responses and chronic physiological Adaptations. Available here. 2. Resting heart rate and all-cause and cardiovascular mortality in the general population: a meta-analysis. Available here. 3. Association of Resting Heart Rate and Temporal Changes in Heart Rate With Outcomes in Participants of the Atherosclerosis Risk in Communities Study. Available here. 4. Heart rate is an independent predictor of all-cause mortality in individuals with type 2 diabetes: The diabetes heart study. Available here. 5. Effect of Resting Heart Rate on All-Cause Mortality and Cardiovascular Events According to Age. Available here. 6. A runner’s high depends on cannabinoid receptors in mice Johannes Fuss, Jörg Steinle, Laura Bindila, Matthias K. Auer, Hartmut Kirchherr, Beat Lutz and Peter Gass PNAS October 20, 2015. 112 (42) 13105-13108; published ahead of print October 5, 2015. Available here. 8. Extremely short duration high-intensity training substantially improves endurance performance in triathletes. Available here. 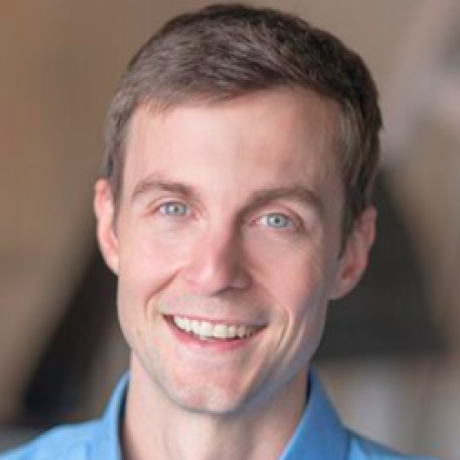 Skyler Tanner is an exercise physiologist based in Austin, Texas where he operates Smart Strength, a HIT-focused, evidence-based, strength training studio. Skyler also regularly brings a fascinating perspective to all things exercise, through insights on his blog. I seem fairly consistently to encounter articles / research in which stats are presented with 10 year age-brackets and then a catchall 60+ (or even 55+). One would think that the later age groups are exactly where the growing health care crisis would come home to roost. Maybe there should be greater visibility into desired v. actual values for seniors. And there is one of the potential downsides with running… risk of injury. This is where properly applied HIT (RT) is such a winner: it is possible to work intensely and safely to a muscle’s momentary limit, something that is very rare in exercise or physical activity. I hear you about the articles/research. The average 60 year-old is certainly not the same as an average 90 year-old. And physiologically speaking there are some 60 year-olds who have far more in common with an average 30 year-old than those in their own arbitrary age-bracket. The more interested and engaged a person is in exercise, wellbeing and fitness the less they are likely to have physiologically in common with their contemporaries as time goes by over the course of a lifetime. And who wants to be average anyway. This is also a challenge of interpreting exercise research in general: out of any population studied the results and conclusions will favor the average of the group. And yet what works best for the average may be quite different for the outliers at either end of the group’s spectrum. “. There was a seen in the movie where they had to run to the aid of the diplomatic outpost surrounded by bad guys, only to find the route blocked and then having to backtrack and go another route. One of the soldiers commented, “I gotta do more cardio”. While the comment ignores the physiologic facts of your discussion it does highlight running as a potentially life-saving skill. You just never know when you might have to hoof it out of a situation. I knew that HIT would provide all that was necessary to have your best possible VO2max, but that the specific skill of running would have to be developed. So I went out to give it a go. It was miserable and I started out at about a 10-minute mile. However, within a few weeks of practice using a combo of 2-mile runs, some sprints and 1-mile timed runs I got my time down to a respectable 6:53. With my 30 inch inseam, my daughter says “you look like a wiener dog when you run”, but I get the job done. Interestingly, my biggest drop in time came as a result of watching and applying info gleaned from YouTube videos on running technique. Another thing that I have noticed is that on the less intense runs the overall response seems to be parasympathetic, as opposed to a HIT session that seems to be entirely sympathetic-driven. This does seem to meet my requirement for an appropriate balance between opposing body systems (anabolic-catabolic, and now, sympathetic-parasympathetic). At this point, running is not a focus for me, other than doing what is necessary to maintain a potentially important skill. Great discussion! Helps to get perspective on the fundamentalist HIT opposition to all things running. Excellent job in taking over 3 minutes off your mile time, inspiration! Very recently (since this chat with Skyler) set myself the challenge of running the fastest 800 meters that I possibly can. First attempt at it to gain a baseline I fell in to what I have learned is the classic 800m error of setting off way too fast and experiencing the misery you refer to. Pretty much ended up as a 400m sprint, with a 400m jog tacked on the end that somehow felt way more unpleasant than the first lap, and resulted in a shocking time of 4 mins! Must have looked like a slow hare morphing into a turtle. Anyway, early days, I have a mix of short sprint workouts, longer interval workouts (both followed by sub-lactate threshold finishers ala Skyler) planned. One quality running workout a week of max 30 mins, 1-2 fullbody HIT, and turn any of my 30 min morning dog-walks (or part of) into an easy easy run whenever the mood takes for the parasympathetic effect you mention and any endocannabinoid-effect I can get. Leading up to testing an all out 800m again in 7 weeks time. Will be checking out technique vids too. Oh, one further comment. Are there any good quality studies comparing other effects of steady state exercise to resistance training, specifically around expression of BDNF, IGF1, cortisol, cyto/myokines etc? It’s my feeling that these must all have intensity thresholds but if less intense exercise over a long period gives you a steady release of say, BDNF for example then that gives you another reason to go for a run. Also, there’s the possibility of benefits around energy expenditure and insulin sensitivity from bouts of “cardio” or even “LISS”/general physical activity. That’s not to denigrate HIT of course, strength is as they say, the currency of movement. Without the resistance training you’d be poorer all round at everything else! You are right to consider intensity thresholds important. I am not aware of any studies that directly compare RT with aerobic exercise, for example relating to BDNF levels. More research has focused on BDNF and aerobic exercise than on RT. Some research has suggested that with aerobic exercise there is a threshold intensity of 60% VO2max required to stimulate a significant increase in BDNF. If this is right a walk isn’t going to cut it. With RT, recent research has shown a hypertrophy protocol (3x10RM, to MMF, short rest periods, 7 exercise fullbody routine) to significantly elevate BDNF, whereas a “strength” routine (5x5RM with 180s rest periods) did not. The researchers concluded: “The expression of serum BDNF is likely reliant on intensity of exercise.” A HIT approach would work. Nice, thanks. The only confounder seems to be popular science reporting stating that things like dancing seem to ellicit the greatest benefits in neuroplasticity, one would assume due to a combination of skill acquisition and BDNF expression(?) I think that would be partially supported by Dr Ambrose’s interview with Lawrence although it’s likely I’m following my biases! Agree with your point re: the dancing. From the little Salsa I’ve done (beyond the sauce): when you start learning there is a mental and physical gap between the taught steps, having to piece these together is likely very good for the brain. Really interesting article. Anecdotally I’d agree that HIT takes care of a lot of your cardiovascular health. Last year I ran a 10k weekly and after a 2-3 month lay off (but continuing twice weekly HIT) I came back with zero difference to my performance. After two years of HIT my resting heart rate hovers around 50 (although I don’t know what it was when I was untrained) with HIT every 3-5 days and a 10k every other week on average (so total “exercise” around 1hr a week). Coming back from 2-3 months off running and not losing a step from your performance is impressive Andrew. Looks like you have developed an exercise habit/schedule that works well for you. Well, it “felt” unpleasant for a couple of sessions but my time was pretty much identical. Full disclosure, I’m not trying to beat my PB or win a race, running mainly for leisure. As always – Brilliant! Thank you. I train with sprint intervals about twenty minutes per week along with HITish training about one hour per week. The sprints probably do not help with the osteoarthritis in my knees but I think of sprinting as a useful life skill like CPR and how to use an AED. It can come in handy in an emergency situation; chasing down dog who doesn’t understand danger of cars a recent example. And as long as I am at the keyboard with a couple of young geniuses.. something about training that my wife is experiencing in the last month or two. Several times she has experienced vomiting or another form of gastrointestinal distress before being able to complete work out. She has not been increasing intensity of workouts, no significant dietary changes, sleep has improved. She is going through menopause. I do not see many people with negative reactions to exercise at the gym but I also do not see that many people working out “intensely” . Maybe one of you could address this in a future blog if it might be of help to enough people. Thanks for the kind words Gayle, it was a lot of fun discussing this topic with Skyler. It is possible that menopause is behind your wife’s reaction. Fluctuating levels of hormones such as oestrogen and particularly progesterone may be responsible for stimulating the nausea and vomiting, especially when you add the acute stress of exercise. From a trainer’s perspective nausea/vomiting would usually only occur during intense exercise if an individual was worked exceptionally hard and given almost no rest between exercises providing a metabolic challenge considerably beyond that which they are used to. As a practical step even if your wife is not rushing exercise to exercise, I would space the exercises even further apart, allowing for good recovery between each exercise, see if that helps. If she still experiences the nausea, back off a little in the intensity too. Alternatively if you workout at a regular time of day, you could see if scheduling the workout at a different time helps. I also recommend talking it over with her doctor. Glad to hear you were able to save the dog!